Tubeless tyres have been used on motor vehicles since the mid-fifties and the first effective tyre liquid tyre sealant was developed by UK-based OKO way back in 1978. Unlike the big branded names from the USA, you might not have heard of them but they've been making the best tyre sealants for 40 years. For motorbikers, quad riders, long-distance lorry drivers and fleet managers the world over OKO is the go-to brand for protecting their tyres and keeping them on the road (or off-road). OKO is the number one tyre sealant brand in the heavy off-road market. If you run 'heavy-plant', tippers, 30-tonne quarry lorries with tyres costing £10k+ a corner then you trust OKO to keep running smoothly. With the proven ability to seal holes in big tyres up to 20mm in size with their thickest formulation, we'd trust them as well. In fact, that's exactly why On-One and OKO have teamed up. On-One have signed up with OKO to become their exclusive UK cycling products distributor. We'll be bringing you the best in OKO's tyre sealant technology at our usual incredible prices. OKO has four targeted solutions and we've chosen the two that best suit our customers. 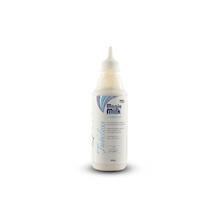 Magic Milk™ Tubeless is designed for tubeless ready tyres primarily aiming at CX and XC-MTB. 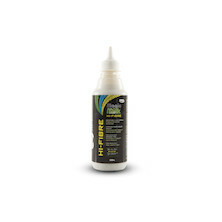 Tubeless is a free flowing solution that will never ball-up in your tyres unless competitors liquids, (we also love this for use in inner tube, but shhh, don't tell anyone). Magic Milk™ High-Fibre is designed to work where other liquids fail - with a high fibre content it can seal larger holes in both tubed and tubeless tyres making it perfect for bigger Gravel bike, DH, MTB and CX tyres. As well as their range of liquids they also have a line of accessory products including injectors to help you get juiced up that we'll be looking at soon, but first, here comes the juice.